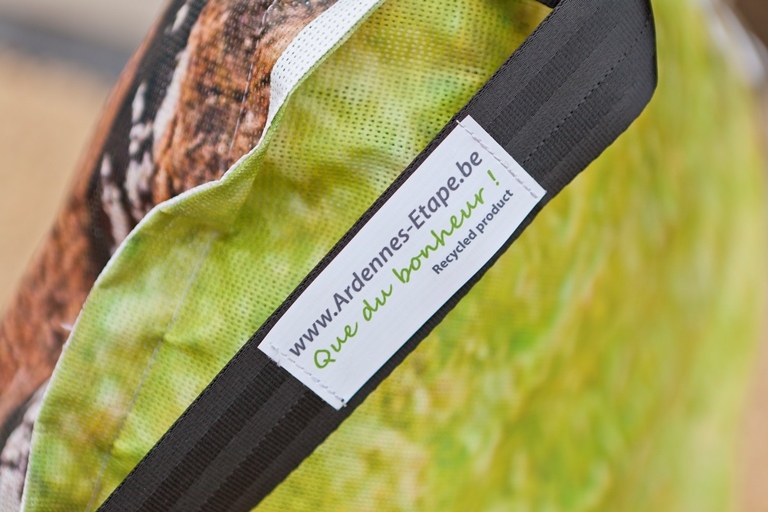 Ardennes-Etape prolongs the life of its promotional material. Enormous advertising poster becomes unique gift for clients and personnel. Responsible entrepreneurship and sustainability, long-term strategies versus brand awareness, visibility and creativity… Combining these principles is no easy task. Finding the correct balance between them, however, is crucial in the strategic plan of every business. After some puzzling, we brought this challenge to a success. Ardennes-Etape took up the challenge, without a grand budget, external resources or world famous advertising agencies. This small business from Stavelot in the Belgian province of Liège with 40 employees combined sustainability and visibility in a creative mix. Marketing goal 2013: ‘brand awareness’. Therefore, we need visibility. Print advertisement, banners and billboards are a few of the means that pop into one’s head. Excellent tools, definitely. But let us be honest; prices are fairly steep and the sustainability is questionable. Nevertheless, we chose one of these ‘traditional’ channels to put the spotlight on Ardennes-Etape. 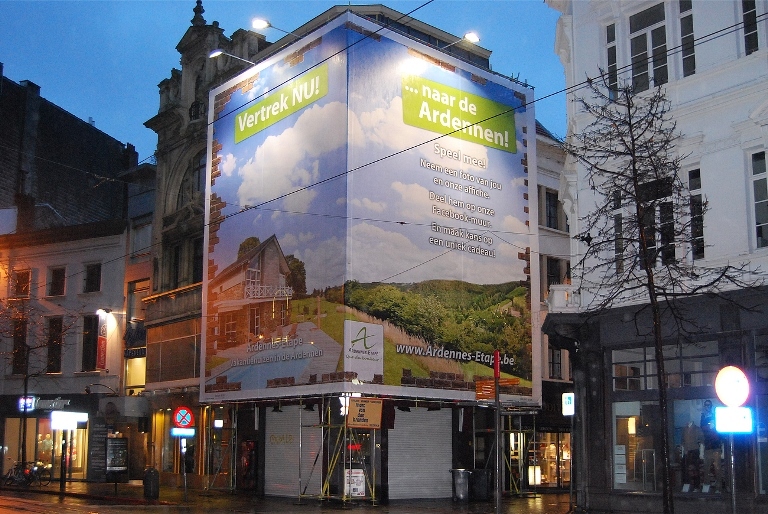 The result was a metres high advertising poster in Antwerp and an even bigger one in Rotterdam. Together they reached 24 million people. So far visibility. Next goal: long-term sustainable entrepreneurship. Our visibility – 120 square metres in Antwerp and 850 in Rotterdam – was removed after a period of one month. The question we raised: how can we extend the life span of this material? 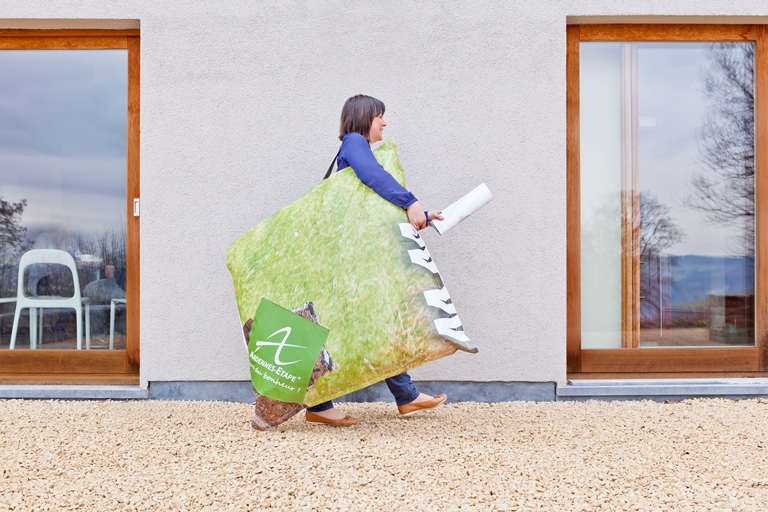 The Ardennes-Etape marketing team found the solution: recycling the poster into a bean bag. Creativity: check. After some searching we found the perfect partner in DesignPoint. This organisation is – just like Ardennes-Etape – one hundred per cent Belgian and works by the principles of social economy. In close collaboration both posters were transformed in 120 by 120 centimetre bean bags. Without wasting any materials, 290 unique bean bags were produced from both posters. Sustainable and responsible. And how does this contribute to our brand awareness? A few people won a bean bag in a contest and employees will also receive one. This way we bring this piece of Ardennes-Etape amidst the public. 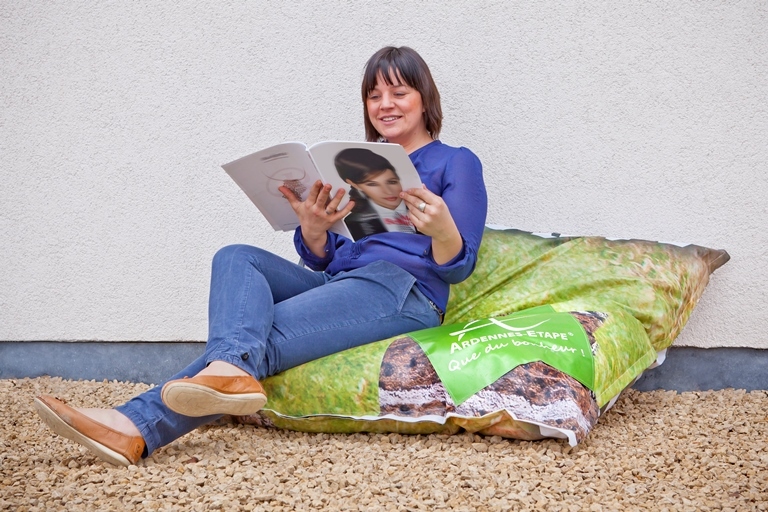 The bean bag – or ‘pouf’ in French – will appear regularly in future campaigns. So with limited resources, a fair amount of common sense and a whole lot of creativity we achieved an optimal result as a small business. After all, restrictions boost creativity. So as the Ardennes-Etape tradition wants… A great example of ‘Que du Bonheur’! This entry was posted in Business, Recent articles and tagged Antwerp, Ardennes, Bean bag, Brand awareness, Creativity, ecological, Holiday homes, Liège, Marketing, Recycling, Responsible entrepreneurship, Rotterdam, sustainability, Technologies, Tourism by Ardennes-Etape. Bookmark the permalink.